From where we stood looking at the horizon, the Auas Mountains, which form the southern border to the country’s capital, were in full view, but there were no remnants of a city. No indication that the capital lay just beyond. No, we were definitely in the middle of the bush. I felt a bit lost, but in the best possible way. Lost in the wonders of nature, surrounded by camel thorn trees, game and the serenity of wilderness. I wasn’t quite sure where we were. We’d only driven about half an hour to get here. Which meant that Windhoek was just a stone’s throw away. Are we this close to a bustling city? 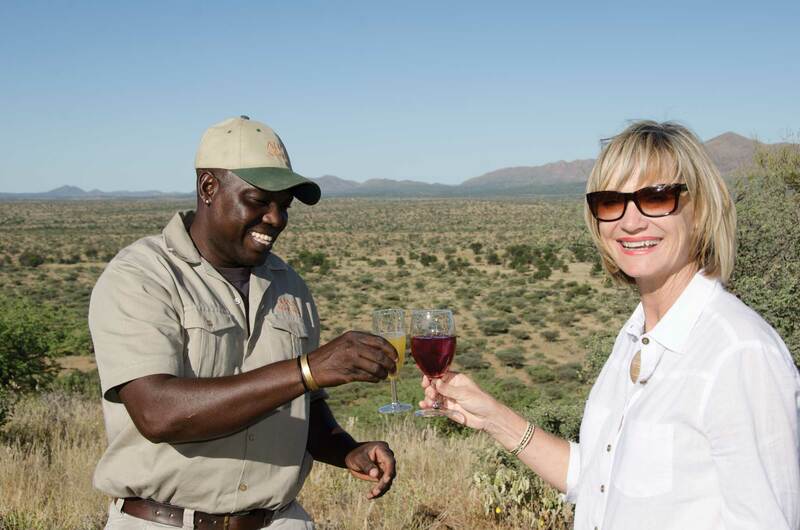 Auas Safari Lodge is less than an hour south of Windhoek. The 10 000 hectare reserve is home to a wide variety of game and bird species and a wonderful bush experience on the city’s doorstep. The 16 en-suite rooms, reminiscent of classic farm-style hospitality, offer visitors a spacious and comfortable stay with the promise of stunning views of the setting sun. On a recent trip to meet the new management, who took over a few months ago, we realised just what a wonderful weekend destination the charismatic Auas Lodge can be. A Groundscraper Thrush hopped around on the lawn as we sat on the veranda outside the lodge’s main entertainment area. Starlings played along the edge of the waterhole a few metres away. Our lunch, a delectably tender steak, was paired with an Auas special, Sandy Shandy, recommended by lodge manager Richard Ford, as we relaxed and enjoyed the meal in the quiet peace of the bush. Sated, an hour of absolute heavenly relaxation followed at the hands of Maria van der Westhuizen and Virginia Velskoen. The two on-staff therapists worked their magic as we let the guilty pleasure of a full body massage seep through our veins, or in this case, muscles. Our spa treatment was followed by a guided game drive in the bush. As we meandered through the tracks snaking between camel thorn trees, over hilly crests and through riverbeds, our guide, Frederick Muronga, originally from the Kavango Region, pointed out giraffe, oryx, springbok and waterbuck. The late afternoon was so utterly enchanting, it was easy to forget that we were less than an hour’s drive from Windhoek. 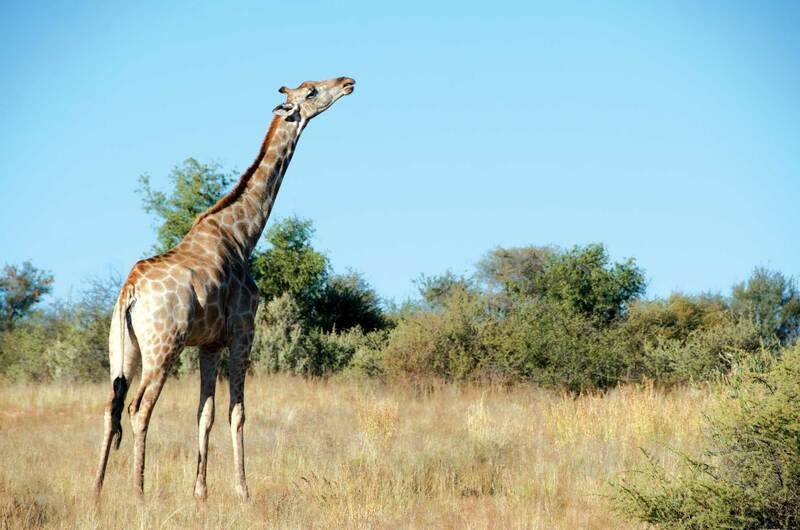 Auas Safari Lodge is home to multiple species of game, including giraffe, eland, zebra, impala, kudu, waterbuck, springbuck and oryx. It is also an excellent place for avid bird-lovers to test their identification skills as LBJ’s (Little Brown Jobs) flit around the game-viewer vehicle negotiating the thick bush. At some point during the game drive a herd of about 40 eland crossed our path and we headed after them for a better look and the chance at some up-close photographs. The thick bush and overgrown jeep tracks caused us to lose our way for a short while, but we didn’t mind all that much. There are worse places to get lost than in a beautiful savannah bushland. Back on the road we continued on our drive while Richard told us of upcoming summer camps for kids to be held at a campsite on the reserve. How thrilling it must be for a youngster to explore such a wonderful place for a week! From the sundowner spot on a rocky outcrop in the centre of the reserve we had a 360 degree view over the valley below and the mountains stretching across the horizon. On the trip back we spotted a herd of about 20 giraffe drinking at a waterhole. A Tawny Eagle perched on a nearby branch. We felt as if we were on a full-blown safari, lost in the awesomeness of nature. 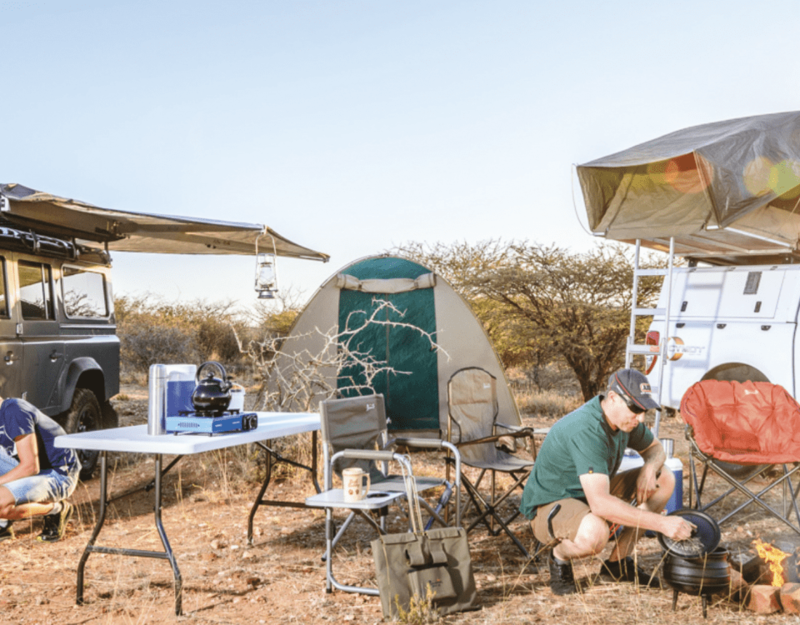 The friendly staff, the alluring wilderness and breath-taking sunsets at Auas Safari Lodge are only three minor reasons to head out of the bustling, tiring city for the weekend, or stop over on your way to or from your next Namibian destination. Laze by the clear blue pool, sip coffee on your personal veranda as the sun rises or relax completely in the Aroma Boma. Whatever your preference, Auas Safari Lodge is a beautiful place to get lost in. Rieth and Frederick say ‘cheers’ to the stunning view. 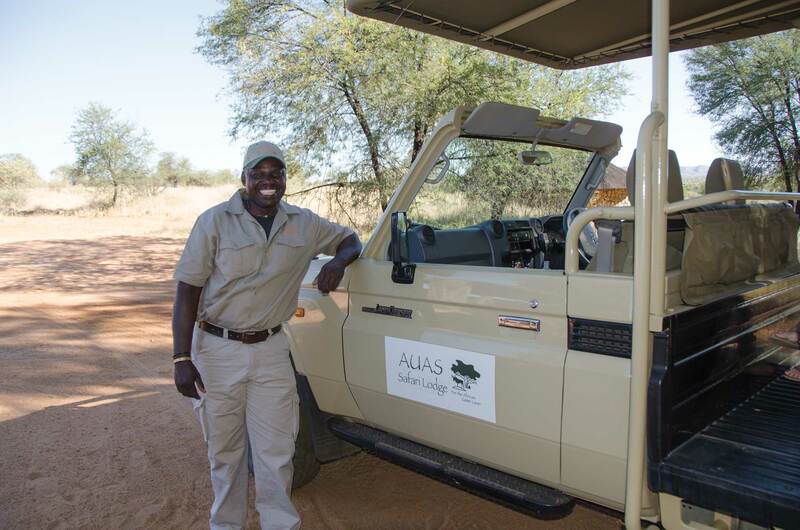 Lodge guide, Frederick Muronga, ready to set off on an action packed game drive. At Auas the kitchen serves organic meat and meat products from their own butchery. You can also buy homemade farm products, including rusks and preserves. 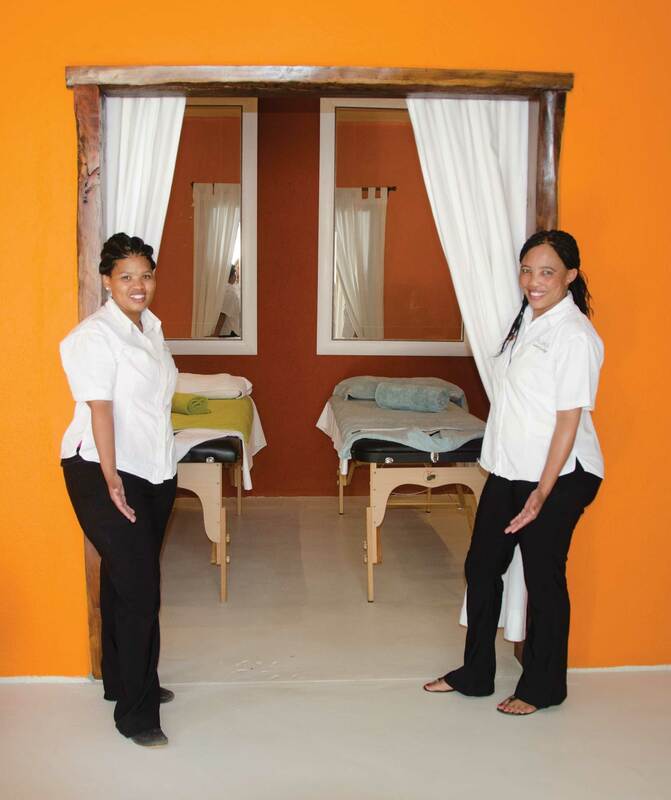 The lodge offers spa facilities, including full body and Indian head massages, facials, manicures and more, at the well-trained hands of Maria van der Westhuizen and Virginia Velskoen. This article was first published in the Winter 2016 issue of Travel News Namibia.